Altometrixs can help in either area by leveraging data aggregating software and a collaborative cloud platform to help clients understand and navigate their data to identify opportunities and mitigate issues. Data aggregation can facilitate rapid analytics. This is an excellent tool to quickly identify current/emerging issues and potential solutions. For the more complex issues, analytical storyboarding is an effective vehicle to move multiple stakeholders to a common area of consensus. Altometrixs combines these approaches to provide a blend of analytical storyboarding comprised of multiple data aggregations and data visualizations. Your team and Altometrixs can work together to determine you’re analytical, visualization and/or storyboarding needs and the optimal means of communicating the “story”. Data visualization and rapid analytics are overarching terms that encompasses a number of activities. The scopes of activities are outlined below to better understand what services/ activities are provided under this analytical umbrella. 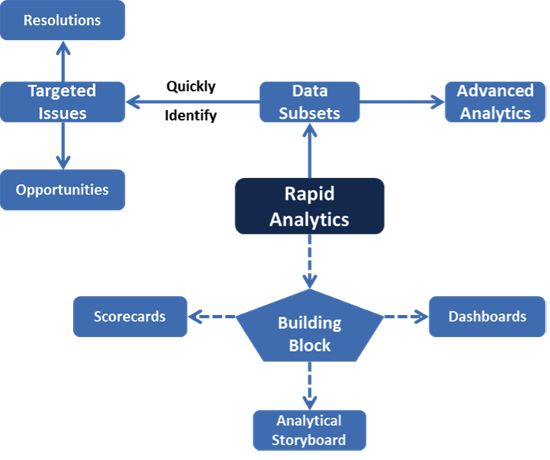 Rapid Analytics is fundamental building block to the service. It provides the means to expeditiously work with large data sets to segment them into manageable targeted analytical areas. It also forms the building block to define and visualize the story. Altometrixs has utilized rapid analytics to assist clients in identifying issues and resolutions across multiple situations. It has also been effectively used to compartmentalize the data into manageable sets of information for further analytics. Some stories are not easily told and this is where analytical storyboarding finds is place. It has been used by Altometrixs for senior level presentations and for designing/communicating comprehensive strategies. It is an excellent vehicle for presenting complex topics because of the mix of visuals and analytics. Altometrixs makes a distinction between dashboards and scorecards. A general rule is that dashboards are typically used for reporting aggregate information and scorecards are more suited for tracking customer and/or contract performance. 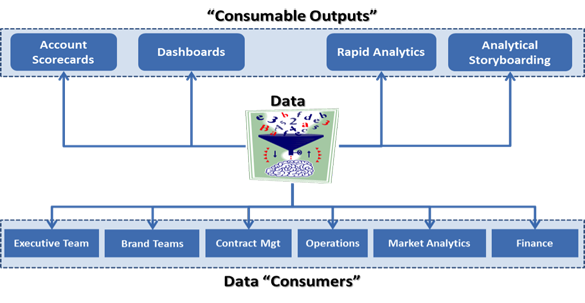 Examples of dashboards developed by Altometrixs have been for organizational metrics, sales, channel and operations applications. These applications are well suited to trending and can leverage technology to make them visual, flexible and “just-in-time”. Additional information is available in the business cases and contact Altometrixs to discuss your needs and receive a demonstration.